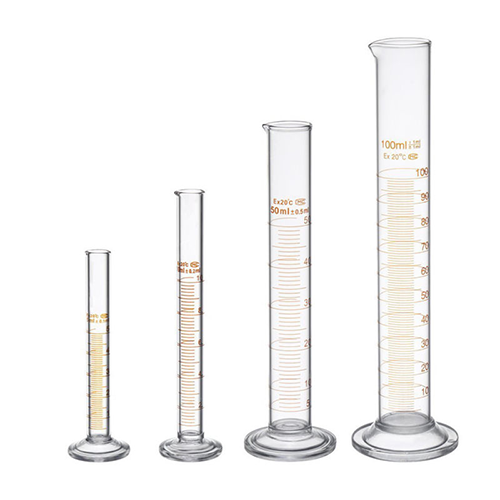 Measuring cylinders serve simultaneously to receive and measure different amounts of liquids. Made from specially drawn tubing with durable, easy to read graduations for assured accuracy. Borosil Brand Cylinders are built to last. We have built strength features into every cylinder. Heavy uniform wall tubing and strong stable hexagonal base contribute to sturdiness. Hexagonal base also prevents them from rolling off a laboratory bench. They are available in capacities from 5 ml to 2000 ml. For accurate work, Class A certified cylinders are available. Our range also includes Nessler Colour comparison and Rain Measure Cylinders.